Chichen Itza is one of Mexico’s most popular tourist destination, and rightfully so. 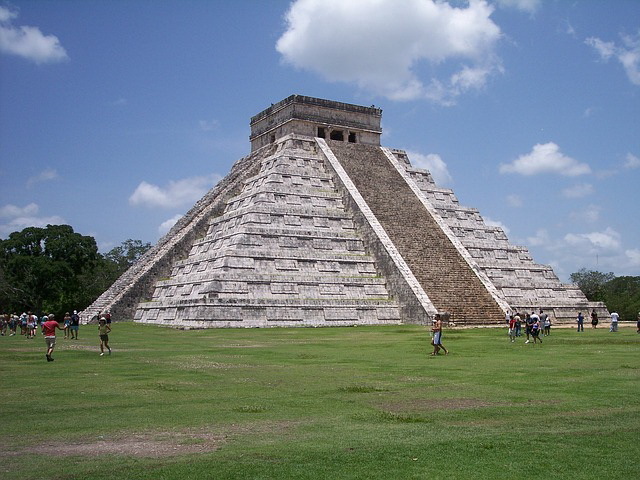 The Yucatan’s grandest archaeological site is Chichen-Itza, a UNESCO World Heritage area of immense cultural significance. Chichen Itza is perhaps the largest, most famous and most accessible Mayan site, about 125 kilometres west of Cancun and Cozumel. This ancient Mayan ruin, a major tourist stop in Mexico’s Yucatan Peninsula, is a rugged place of soaring pyramids, massive temples, startling carved columns and do-or-die sports fields. The focal point of the region, an amalgam of an older Mayan city and newer Toltec settlement, is the towering Castillo pyramid, which is fraught with cosmological symbolism. Its four sides contain 365 steps (depicting the solar year), 52 panels (for each year in the Mayan century as well as each week in the solar year) and 18 terraces (for the 18 months in the religious year). Inside, the Castillo is an interesting temple accessible up a narrow stairway. Mayan sports included a game with a soccer-sized ball that had its own intricate rules and provided exciting competition for huge crowds of spectators. 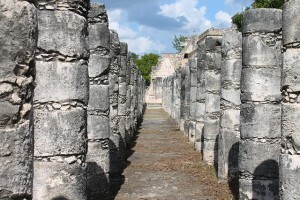 The enormous Chichen-Itza court where this game was played is the largest ever found and is lined with fascinating carvings that display the rules and details of the sacred game. One carving even shows the captain of the losing game being beheaded. 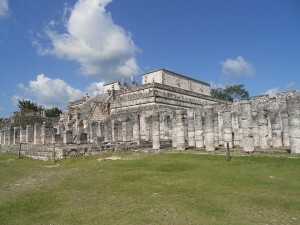 The site also contains a sacred well, the astronomical Observatory, the imposing Temple of Warriors, the reclining Chac Mool figure, a form of classic Maya sculpture believed to have served as an altar for sacrifices, and the Nunnery. 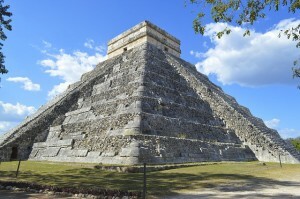 During the fall and spring equinoxes, the sun’s shadow forms an enormous snake’s body, which lines up with the carved stone snake head at the bottom of the Castillo pyramid. At Chichen Itza, the Sacred Cenote is a natural well 60 metres in diameter with sheer, escape-proof walls plunging 22 metres. Winsome maidens aside, excavations in 1882 and 1968 discovered that strapping six-foot warriors – old scores settled? – and infants were also tossed into the pit. Across from El Castillo, the Temple of the Warriors is also known as the Temple of the Thousand Columns. On top of it there is a stone on which steaming human hearts were offered to the gods. Paintings on the outdoor pillars have all but disappeared, but inside an older temple beneath this one, colors are as bright as when they were freshly mixed from vegetable juice and mashed insects. Several smaller buildings hold interest mostly for their relief sculptures depicting dire events of the time. But one that really makes you sit up and pay attention is a huge ball park. Each of two 27-foot-high walls running its 480-foot length has a small stone ring near the top, through which a hard rubber ball had to be shot. When you cross the highway bisecting the archeological zone, you leave behind unpleasant murals and evidence of human sacrifice, for these are buildings from pre-Toltec times. Unfortunately the Spaniards destroyed all religious records. In consequence, nobody knows for certain that the ornate structure, 70 yards long and 18 yards high, was actually a nunnery. However, built in 600 A.d. beside a church, it has many little rooms reminiscent of the convents in Spain so they named it the Nunnery. 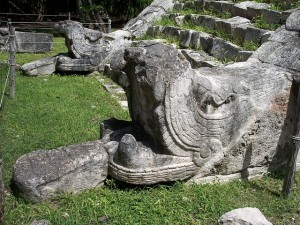 In Chichen Itza you can also find the Caracol (Spanish for snail), so called for its spiral staircase. The substructure is believed to have been completed around 700 A.D., and the 48-foot circular tower added later. This is the all-important observatory.